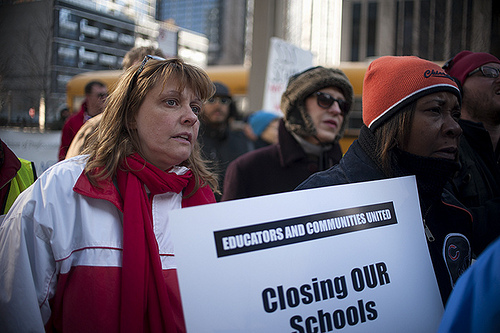 Chicago Teachers Union members and other demonstrators protest school closings on Nov. 12. Even as they released the updated list of under-utilized schools, CPS officials stressed that simply having empty space will not be the death knell for schools. Some 330 schools are considered under-utilized by CPS, which calculates its rate based on a figure of 30 students per classroom plus ancillary rooms for art, library and special education students. District leaders refuse to say how many schools will be on the chopping block. School action guidelines allow the CEO to consider a host of other factors, including safety, leadership and whether the school has recently been affected by any school actions. This might mean that recent turnaround schools—a process in which an entire staff is fired and replaced and the district, and in some cases the federal government, provide extra money for improvements—may be spared. Also, if it costs too much to move students from one building to another or if no better schools are nearby, a school may be saved. The data also show that 28 charter schools are rated as under-utilized, but 11 of those just recently opened and six of them are adding grades. Only three of the under-utilized charter schools are losing enrollment. They are Betty Shabazz Charter High School—DuSable, Urban Prep—Englewood and ACE Technical Charter School. CPS officials say they will consider utilization status when renewing a charter school. Shabazz and ACE are up for renewal this year. For the first time this year, CPS officials included, with the utilization rates, data on the enrollment trends of the building and the cost to keep it maintained with any necessary repairs. That information shows that 230 of the 330 underutilized schools lost enrollment and of those, 36 percent lost one-fifth of their population over the past two years. CPS officials also have made a point of emphasizing the number of schools that are more than half under-utilized. Spokeswoman Becky Carroll says this should not be considered an indication that these schools will be targeted. Those schools that are more than 50 percent under-utilized are way more likely to serve African American students and be rated as Level 3, the worst rating given by the district. The map below shows all underutilized schools, with those more than half empty identified by the red marker.